I have mentioned this timeless meditation technique briefly in several articles on Mastery of Meditation before, but now I would like to provide all the details regarding it, in order to help you learn and master it. 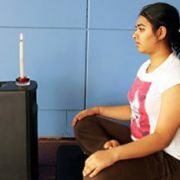 This meditation method is called Trataka or candle flame gazing, and it was introduced in the following 2 articles: Brain Development & Enlightenment Series Part 1: Awaken the Senses and Yoga Meditation Techniques – The Top 3. It is now the eight guided meditation of our Free Online Guided Meditation Techniques Book. Although Trataka is famous for being a meditation to build concentration, it has a solid list of other great benefits as well, which I will detail below. This meditation technique comes from the school of Yoga, and has been widely embraced due to it’s simplicity and effectiveness. Candle, candle holder and lighter/matches. Terrific for building and improving concentration. Builds mental fortitude, mental focus and willpower. Calms the mind and bestows inner peace and silence. Stimulates and activates the Third Eye Chakra (Ajna Chakra) to bestow wisdom, intuition and psychic powers. Helps penetrate the veil of duality and see the non-dual nature of Reality. Be careful not to strain the eyes excessively when practicing this method. Sit up in any comfortable relaxed position, preferably with the spine straight. 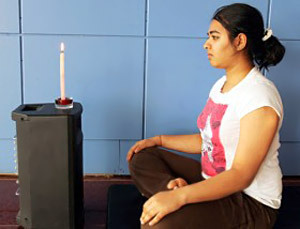 You may also sit on a chair to practice this meditation. To practice this meditation your must hold absolutely still. Place your hands in Gyan Mudra. Such that the thumb tips and index finger are meeting, while the other three fingers are extended. Rest your wrists gently on your knees with the palms facing slightly upward. Gyan mudra will help you with your concentration. Make sure the room is darkened and there is no breeze of any kind. Light the candle and ensure that it is about 3 feet away from you and at eye level. You may need to use a long candle holder to accomplish this. Begin to gaze, without blinking, steadily at the candle flame for as long as comfortable. Once the eyes tire or start to tear up, close them and then position the afterimage of the flame between the eyebrows at the center of the forehead (the physical trigger point of the Third Eye Chakra). Focus on this afterimage, trying to keep it steadily fixed in the region of the Third Eye Chakra described above. Your level of concentration will determine the clarity of the afterimage. If the image wavers, moves or looses clarity, just reapply your concentration and restore the position. Once the image fades out completely, open your eyes and begin again focusing on the candle flame. Continue this cycle for 5-10 minutes. As your capacity to concentrate and meditate grows, increase the time by increments of 5 minutes till you reach 20 minutes. You may do this meditation even longer if you like. It is not uncommon to practice this technique for up to 1 hour, by those who are passionate about building concentration and mental focus. Try to get a decent size flame (make sure the wick is of good length). It will help prolong the afterimage and make it easier to practice the concentration portion of the meditation. Don’t strain the eyes during the gazing period. Over time your eyes will adjust and allow you to concentrate on the flame for longer periods of time. How Much Time Should You Practice Meditation For Daily? Hello. I teach meditation classes as well. My opinion is that you do not need to wear your glasses during this meditation. The image of the flame will be sufficient for you to complete this successfully. i wear spects so is it comfortable for me to do the trataka yoga? Which routines are for astral projection and or Lucid dreaming. also the routine for psychic ability build up to straight 90 min.? can you do 30,30,30 and should you be doing other exercises too? I am practising trataka and would like to know if there are any preparation exercises for the eyes before and after the trataka ? also how many weeks or months can i continuosly practise this exercise? Zen Meditation, Tratak or So Hum, all will help. Feel free to let us know of any issues or concerns you may have.